Home > Membership > Nonprofit World > Corporate Restructuring - Do You Need It? 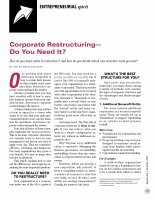 Corporate Restructuring - Do You Need It? Save time searching and have helpful articles like this one delivered to you. Your nonprofit deserves the best resources and the support of recognized experts.